Directions (Q. 1 – 5): What approximate value should come in place of (?) in the following questions? 1. (21/47) ÷ (179/234) × 141 + 3278.12 - 42 % of 899 =? 3. 90% of 12599 + 120% of 32999 – 635.92 =? Directions (Q. 6 – 10): Study the following information carefully and answer the given questions. The following line graph shows the total number of students from 6 different colleges in a certain year. 6. 23 % and 32 % of the students from college P and R respectively are going to symposium in college A to participate all the events. 52 % of the students from college A doesn’t participate any event, which is equal to 78 % of average number of students from all the given colleges together (i.e., college P, Q, R, S, T and U). Find the total number of students participated in symposium events from college P, R and A together? 7. Total number of students from college P and R together is what percentage of total number of students from college Q and T together? 8. If the ratio between the total number of girls to that boys from college S and college T is 43 : 32 and 27 : 23 respectively, then find the difference between the total number of girls to that of boys in college S and T together? 9. Find the total number of students in college B, if the total number of students in college B is 380 less the average number of students from all the given colleges together (i.e., College P, Q, R, S, T and U)? 10. Total number of students from college P, R and U together is approximately what percentage more/less than the total number of students from college Q, S and T together? 1) (21/47) ÷ (179/234) × 141 + 3278.12 – 42 % of 899 =? 3) 90% of 12599 + 120% of 32999 – 635.92 =? 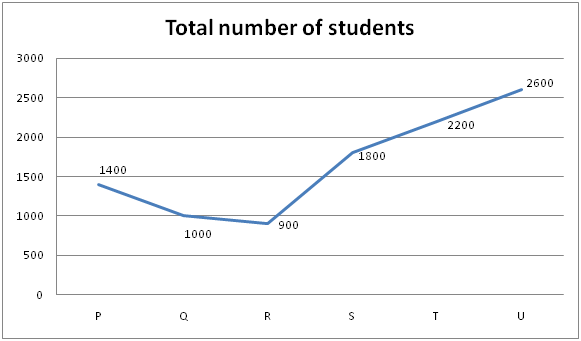 The following line graph shows the total number of students from 6 different colleges in a certain year. 6) 23 % and 32 % of the students from college P and R respectively are going to symposium in college A to participate all the events. 52 % of the students from college A doesn’t participate any event, which is equal to 78 % of average number of students from all the given colleges together (i.e., college P, Q, R, S, T and U). Find the total number of students participated in symposium events from college P, R and A together? 7) Total number of students from college P and R together is what percentage of total number of students from college Q and T together? 8) If the ratio between the total number of girls to that boys from college S and college T is 43 : 32 and 27 : 23 respectively, then find the difference between the total number of girls to that of boys in college S and T together? 9) Find the total number of students in college B, if the total number of students in college B is 380 less the average number of students from all the given colleges together (i.e., College P, Q, R, S, T and U)? 10) Total number of students from college P, R and U together is approximately what percentage more/less than the total number of students from college Q, S and T together?